Fire alarms in commercial premises require, by law, regular servicing by a Competent Person to British Standard 5389:2017. The legal requirement for this is stated in the The Regulatory Reform (Fire Safety) Order 2005. Midpat Services can help fulfil this requirement using our trained Service Technicians to carry out your fire alarm inspection. Fire alarms require a specialist knowledge to ensure that they will work in the event of an emergency. As a result of this, the only sure way is to entrust the servicing and inspection to a qualified Competent Person. We are able to carry out periodical inspection, fault finding and replacement / repair of faulty components as well as Certify the alarm as fit for purpose following the recommendations of BS5839. Weekend Out of hours site attendance is not a problem, (we understand the disruption fire alarm inspection can cause to workplaces and public areas). A free survey is included to help us identify the system you have in place to enable us to send the most suitable engineer for the job. This also allows us to reserve parts should they be required without delay. Our 24 hour client area allows the download of your relevant documents and Certificates should you need to send them to Insurers or 3rd party bodies (eg CHAS). 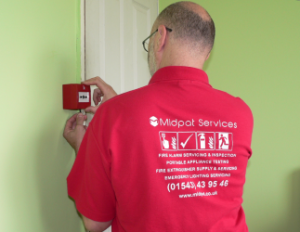 Midpat Services offer a complete fire alarm servicing Inspection and fire alarm repair service to Cannock and the surrounding area.